The brutal massacre of 130 school children in Peshawar on 16th December is not just shocking and saddening, it is a most abominable and condemnable act much like any such act of killing civilians, particularly children, by anyone. The Teherik-e-Taliban (Pakistan) has taken responsibility of the massacre and are facing condemnations from across the world. However, knowing the history of imperialism or of fascism, probably one would never know the hands that could have been behind such ghastly attacks. From engineering a coup against a democratically elected government of Chile, to the façade of the “weapons of mass destruction” to fuel a brutal invasion in Iraq; from the “Reichstag fire” by Hitler to propel his unchallenged ascendancy, to plans to orchestrate “terror attacks” killing US civilians and army only to justify a war on Cuba under ‘Operation Northwoods’; from the hoax of ‘Gulf of Tonkin fire exchange’ that mobilized support for further aggression against Vietnam, to the botched & CIA scripted “Nayirah testimony” that mobilized support for the Gulf War; – the list is endless. Even in our own country, the Mecca Masjid, Malegaon or Samjhauta Express killings that later turned out to be the handiwork of RSS affiliates, was for the longest time projected by the media as “Islamic terror” and some even apparently took “responsibility”. We were all led to believe the hoax which was used to orchestrate witch hunt & fake-encounters of hundreds of Muslim youth. There are also instances like the ‘Parliament attack’ or the ghastly ‘26/11 Mumbai terror attack’ which even government officials within the CBI have later claimed to be “set-up” by the state itself to justify more stringent anti-terror laws – POTA after parliament attack, and a more stringent UAPA after 26/11. There were gun-wielding combatants, there were hundreds of lives lost, but whose were the hands behind such attacks, probably one would never get to know. But what we do know is the fact that every time, after such attacks, the imperialist sponsored “war on terror” has got more fillip, it has entailed more draconian laws, more unaccountable power in the hands of the state to orchestrate witch hunt. Similarly, what would follow the Peshawar attack is not hard to guess. 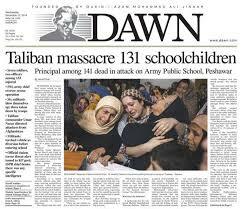 The ominous forebodings were obvious even as news of the disaster was still tricking in from Peshawar. The same night, for instance, Times Now flashed in its prime time show: “Is US presence inevitable in Pakistan?” This is precisely what would unfold and also justified in the days to come. Which is to mean more drone attacks; more bloodshed; more “strategic tie-ups” between subservient states of the likes of India, Pakistan or Afghanistan in the subcontinent with US imperialism & Israel; continued US military belligerence; and more “anti-terror laws”. This much we can know for sure. Having said all of this, here, however, we still encounter the pertinent possibility of the ghastly Peshawar massacre being the handiwork of Tehrik-e-Taliban (Pakistan) itself, as per its claims. Even the Afghan Taliban seems to confirm the same in their condemnation of the act as being “un-Islamic”. And as such, how should we then be looking at the Peshawar massacre? Of course, as has been stated above, any such act of the Taliban, particularly one that targets civilians or children, apart from being unjustifiable by any means, is also to be condemned in the strongest possible terms. But the difficult and more fundamental question to be asked here is who should really to be held responsible for the Peshawar massacre? We believe that it is the belligerent US imperialism that must ultimately be held responsible. The US cannot wash its hands off from the blood in Peshawar as it prepares itself for further bloodshed riding on the same.